In order to gain access to the boiler for the Resco inspection the regulator valve assembly has been removed. Whilst removed we have taken the opportunity to service the valve which has involved machining the valve sliding surfaces. 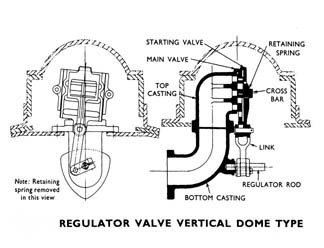 29's Regulator valve "Top Casting" (see illustration below) showing the sliding surface on which the big valve travels and opens the ports to allow a large amount of steam to the cylinders . Placed on top of the big valve rests a smaller valve (small valve) with two ports half the size to pass a small amount of steam and make starting the locomotive easier. Both valves are connect via linkage to the regulator handle in the cab and are held in place by a spring made of strip steel which is held in position by the two studs shown in the photograph. 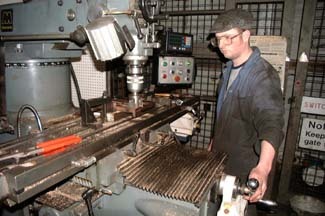 Fitter Paul Middleton machining the regulators "Main Valve" (see illustration below). 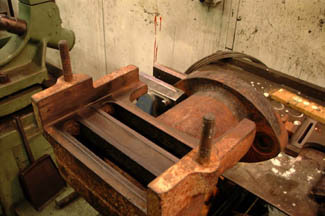 This valve has two faces the big valve face is laid down in the milling machine and the "Starting Valve" (see illustration below) face is being machined. You can tell which face is on top as the big valve face has a cast stop on top . It can be seen pointing down in the machine. Click on image for close up of machining. Click the illustration for a detailed view.